Double speed technique has greatly increased production efficiency. High and low speeds can be chosen. Pressure drop prevention and vacuum absorbing device eliminates pressure drops and leakage during production. Able to set target amount via a touch screen. The device then automatically increases or decreases the flow to reach the target. The color touch screen displays many functions such as level of completion, supervision requirements, etc. The transport line applies the latest techniques for inverters. 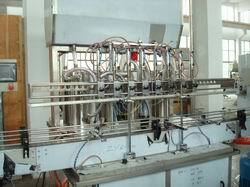 The transport speed can be adjusted freely, thereby solving the problem of oil splits during bottle acceleration. Concurrently, output can be increased by controlled acceleration or deceleration. Our machines utilize a Siemens program controller for this process. The photoelectric inspection system is that of Turck in Germany. 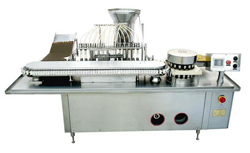 The unique design is especially to prevent dripping when filling various style head and back suction systems, thus ensuring that the production site and packaging are clean. 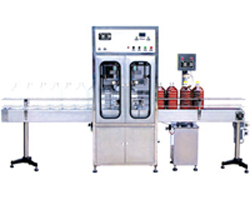 Highly adaptable automatic and semi-automatic pneumatic device is designed for adaptability. The pneumatic capping part has different specifications and different shapes. Spinning is guaranteed. The incoming liquid supply mechanism uses high level grooves and pressure to channel the fluid; the pump pressure greatly improves productivity. A matched set for highly efficient sealing: The aluminum seal is moisture-proof and prevents overflow to raise the product grade. The transistor sealing device's unique induction and cooling system make it safe and effective. Uses a reputable gear pump, highly integrated circuitry design, and a complete-sealing circulation system to ensure long-term reliable operation. Includes an automatic tracking/adjustment system and automatic monitoring. The screen is a 240 * 128 large-screen LCD. The printing information editor directly is controlled by keyboard, without changing chips, and connects to computers and/or use special software to automatically print the date, time, batch number, etc. The script height of 1.5-15 mm is adjustable and can print 1-3 lines. 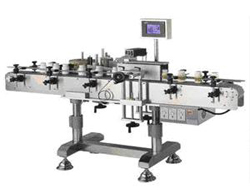 The auto labeling machine adopts digital controls and synchronous follow-up and is characterized by a mutual motor control that ensures synchronous speed and bottle rolling. 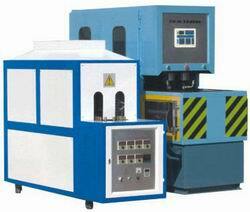 It is a modern electromechanical product with reliable performance. It collects bottles and matches bottles and labels automatically. 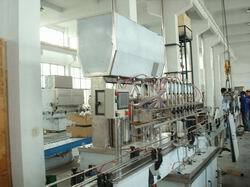 It can be equipped with an ink printing machine to finish label printing. 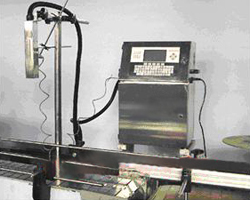 The auto labeling machine is clean, mildew-resistant, durable, and has long-lasting adhesive. Specifications: 28 diameter flat pressed cap. If you are interest in our oil filling machine or you want to set up an oil filling line, please don't hesitate to write us fron the following form, we are always at your service!